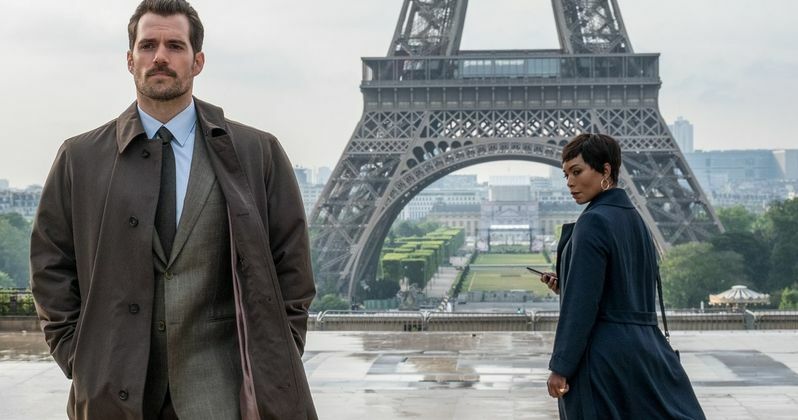 Just days after the Mission: Impossible - Fallout title was revealed, along with a new photo of Tom Cruise, another image has surfaced featuring Henry Cavill as August Walker and Angela Bassett's new character. They are visiting Paris, with the Eiffel Tower seen in the background. This isn't too surprising ,since it was announced last February that this sequel will shoot in France this past spring. How Paris fits into the story remains to be seen, but we could learn much more next week, when the first trailer drops. A report from this weekend claimed that Mission: Impossible 6 will be showcased in one of Paramount's two Super Bowl trailers, with the studio also expected to promote its spring thriller A Quiet Place during the big game. That report has not been confirmed by the studio, but makes sense to use the big game to drop the first footage from this highly-anticipated action sequel, which is slated to debut on July 27. It's possible that this footage will offer a glimpse at what is believed to be Tom Cruise's most death-defying stunt to date. Henry Cavill's mustache can be clearly seen in this photo, which caused quite a bit of controversy for Justice League. The Justice League reshoots had to go on much longer than expected, which conflicted with Henry Cavill's shooting schedule on Mission: Impossible - Fallout, and since Paramount wouldn't let the actor shave off his mustache, Warner Bros. had to digitally remove it in post-production. The mustache was quite the source of controversy for Justice League, which was discussed by fans quite often when Justice League was in theaters. It remains to be seen if it will remain a controversial topic when this Mission: Impossible movie hits theaters this summer. While we don't see Tom Cruise's Ethan Hunt, the actor also made headlines of a different variety last year, when he broke his ankle during a stunt, where he leapt from one building to another. The mishap actually halted production for seven weeks, although it did not affect the July 27, 2018 release, which had been set long before filming ever started. While this was certainly not the death-defying stunt that was teased by producer David Ellison last year, who claimed it would be the actor's most impressive stunt to date, this stunt did get its fair share of press, with the actor even discussing the stunt alongside his cast mates on The Graham Norton Show in the U.K. last week. Director Christopher McQuarrie explained that this new Mission Impossible title, Fallout, has "multiple meanings," including the, "threat of nuclear terrorism hanging over the movie," along with the more literal notion that, "what's happened in the movie is the end result of choices that Ethan Hunt has made in his life." Tom Cruise leads a cast that includes returning stars Rebecca Ferguson (Ilsa Faust), Ving Rhames (Luther Stickle), Simon Pegg (Benji Dunn), Michelle Monaghan (Julia), Alec Baldwin (Alan Hunley) and Sean Harris, with Henry Cavill and Angela Bassett among the newcomers with Vanessa Kirby. Christopher McQuarrie also became the first director ever to make two Mission: Impossible movies back to back, after directing Rogue Nation in 2015. Take a look at this new photo, courtesy of Tom Cruise Twitter.